ALMOST one month after Nigeria bade farewell to literary icon, Prof. Chinua Achebe, issues associated with the colourful rites of passage are yet to be exhausted. 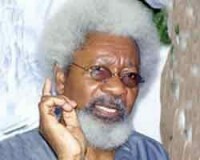 Nobel laureate, Prof. Wole Soyinka, Wednesday came down hard on those he says are still ‘caviling’ at his absence from the funeral of Achebe that climaxed on May 23, 2013 at his home-town, Ogidi, Anambra State. Soyinka, in a recent interview with The Guardian, had frowned on making his ‘absence’ from the funeral a subject of debate on the Internet. “For me, this is so mischievous and dishonest. If I didn’t go to the funeral, it was because I couldn’t. In any case, we all have our way of sending off people. I haven’t seen J.P. ... since we made that statement. I am sure that there were reasons why he couldn’t be there. There are reasons why I couldn’t be there. But my presence was still there. As far as I am concerned, I was heavily there. We all have different attitudes to this thing. The media, especially a lot of this Internet blogs and so on, should just lay off and stop polluting the airwaves with their own diseased antagonism which they want to foist on other people. The renowned dramatist, poet and social crusader insists: “I do not pander to the expectations of the sanctimonious,” noting that he could absent himself from any event, “for reasons that are personal to me. “I can absent myself as the result of a mundane domestic situation, as legitimately as from a visceral rejection of occupancy of the same space, at the same time, in the same cause, with certain other participants.